Growing Greens organically grown cotton fitted diaper size newborn with cord dip snap. Made in USA. Babee Greens organic cotton is grown and milled in the USA. 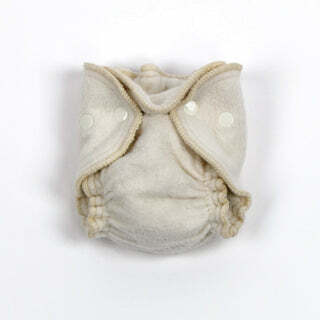 For your newborn, a beautiful organically grown cotton diaper made to fit a newborn baby. The cord area snaps down for the cord time. Then leave that snap unsnapped later on. The doubler is included but does not snap in. Yay! I don't love "snap bumps" inside diapers very much. 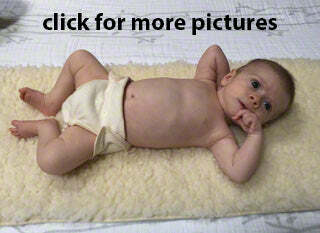 There is no bumpiness inside the diaper for baby to lay on - just soft cotton inside. It is easy to add the doubler by just laying it in there when baby begins growing more and wetting more heavily. 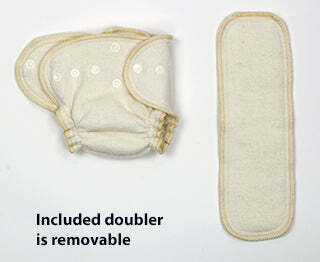 Without the doubler, the diaper is nice and trim and small, which is what a newborn baby needs. 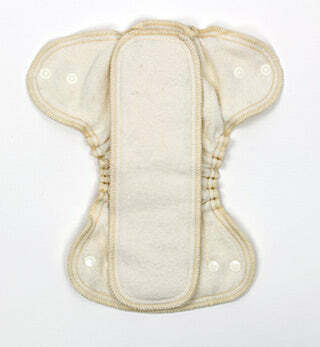 But, soon baby does need more absorbency, so lay the doubler in when it becomes needed. Also, you can just lift out the doubler for cleaning off messes without having to dunk or spray the entire diaper. Made of 100% cotton, organically grown. 100% unbleached cotton thread and natural latex free elastic. Even the threads are cotton where as other brands use polyester edge thread. This is the most natural diaper. Made in USA. Need this in a bigger size? See Growing Greens One-Size Fitted Diapers from Babee Greens. Babee Greens is a 100% natural fiber company. We never use man-made or synthetic fibers. At Babee Greens, we design and manufacture all of our products in the beautiful mountains of Asheville, North Carolina, USA! Newborn diapers are for newborns. 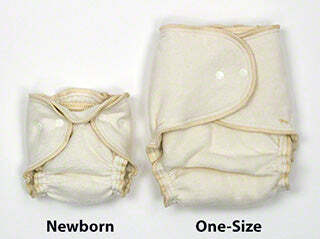 One-size diaper are really much bigger diapers and are really better starting at about 12 or more pounds. 12 pounds, 2.5 months at largest setting. Wish I knew about this earlier. These diapers (Babee Greens Newborn & One Size) are super soft. I have heard some people say they get less soft over time but I did not have that experience. However, my baby did not have this very long before she outgrew it. She was still in size "preemie" (like Burt's bees preemie not genuine tiny preemie) when they arrived, and she was able to fit it through "Small" sizes. I do wish I knew about these before. This was my first baby and for whatever reason the cord stump getting in the way of the diaper did not occur to me. I also did not know anyone who used cloth diapers, but I was committed to using organic cloth diapers and wool covers whenever possible. I had a lot of leaks before the cord stump fell off, since I totally did not know what I was in for, and did not know there were wool covers for newborns either, so I was primarily using Disana's tie diapers (Not that Disana's tie diapers are not great, just that fitteds are less stressful for my baby). By themselves LOL. I did have 3 organic newborn AIOs (Smart Bottoms) I received as a gift but they did not fit my baby's legs. Everything else I had either did not fit around the stump, or was in size Small since I thought that's where baby would start. I do not know how I watched cloth diaper videos on youtube and completely missed the obvious cord stump info/newborn diapers.